How posh does that look? And yet, it only took me 40 minutes to make and all cooks in the oven at the same time – no saucepans to wash up, nice and easy. Pork is quite lean so this is also low-fat. Positively good for you. Pork, lemon and sage work well together with the pinenuts for texture and contrast. 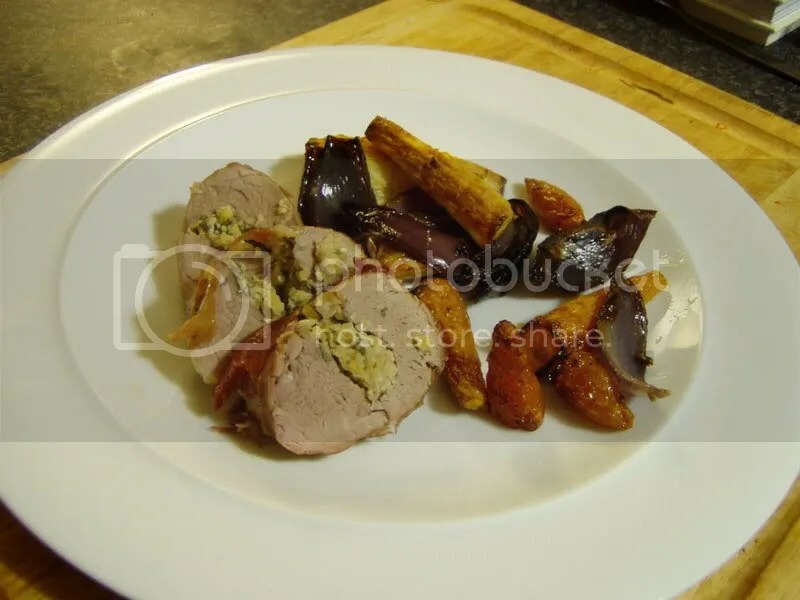 I made it with roasted parsnips, carrots and red onions because they all release sugars and are quite sweet when roasted and so counteract the sharpness of the lemon with the pork. The whole thing balances very well. Veg for roasting. I recommend any of the following: parsnips, swede, red onions, red peppers, carrots, squash. Pre-heat the oven to 190C/370F. First do your prep – peel and slice the veg into appropriately-sized pieces according to how you want them. Put them in a roasting tray, sprinkle them with salt and drizzle with olive oil and give it a shake so they’re all evenly covered. Grate the lemon rind, but make sure that you don’t also grate the pith (white bit) because that’s bitter. Put the pinenuts in a plastic bag and bash them with a heavy implement (a can of beans or a rolling pin will do). Chop the sage leaves finely. Mix these three ingredients together. Slice the pork loin almost but not completely in half lengthwise and open it out butterfly-style. Put the stuffing mix in the middle of the opened-out loin and close it up again, encasing the stuffing. Pop it onto the roasting tray and put everything in the oven. After 15 minutes, give the veg a shake and turn over the pork. After another 15 minutes, it should all be done. Slice the pork into medalions to make it look pretty. Serve it up. Tasty. That looks delicious, it’s one I’ll try over the Christmas holidays, and so quick and easy. I will definately try this.I make something similar stuffed with dried fruit,apricots,apples,and prunes. 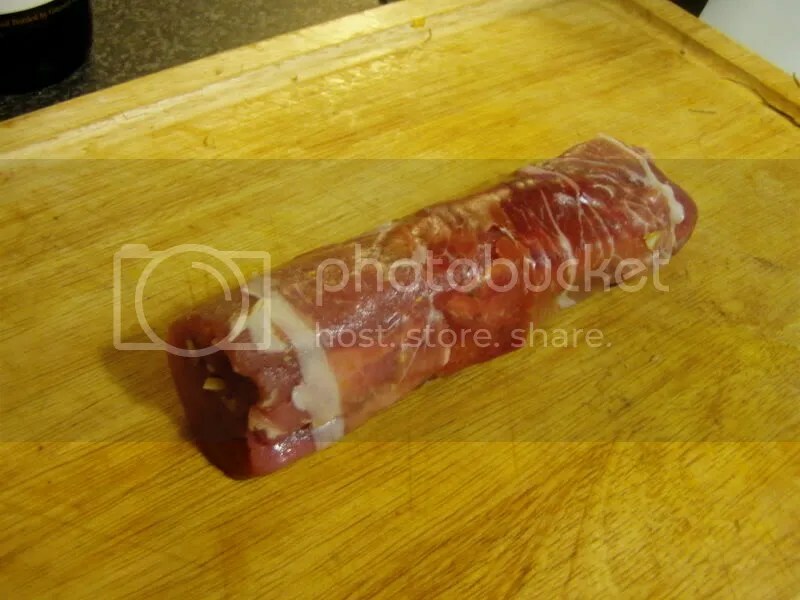 Wonder if you fry the pork first to seal it,or does it remain tender without this proceedure? Anyway, I can use the rest for this recipe….